Recently I had the opportunity to teach Yoga in a studio. Like, in a room that’s made for Yoga…where the floors are clean…the blankets are folded and plenty…the temperature is relatively under control…the lighting can be dimmed…the doors close and no one else comes in. Because I teach in offices, I felt like a kid in a candy store, being able to turn the fan on when we started to heat up in the studio. Turning down the lights when it was time for Savasana. Leading a silent meditation and it was actually silent in the room. This is not the norm for me. Most often, we are holding Yoga classes in conference rooms, where the participants have just had meetings at a giant oak table minutes before class. The temperature is set by some other department and cannot be adjusted. The lights are usually fluorescent and unchangeable. 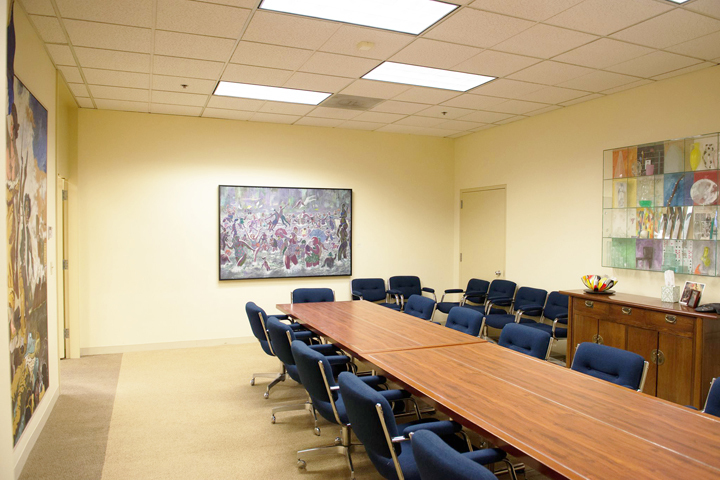 Sounds from the office find their way into these rooms – phones ringing, people gossiping. At some locations where we practice in the cafeteria, there are sounds and smells of people making their lunches. And for us, that’s in whatever space we can find in the office. So, it’s partly my job to transform the space as much as I can. 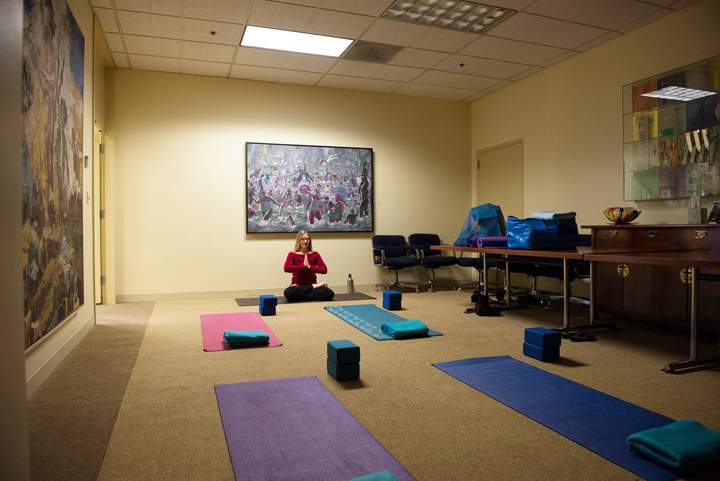 To have the tables/chairs moved before people show up for class (whenever possible) so when they enter, it’s no longer the conference room where they may have just had a difficult meeting, but rather it’s the place where they practice Yoga. Soft music. The “Yoga in Session” sign on the door so that other folks from the office know to be respectful and quiet in the surrounding areas. Eye pillows at the ready for places with particularly harsh lighting. Although I’m not a fan of strong incense or oils, sometimes I’ll just open a bottle of lavender so there is a subtle scent in the air. We do what we can with the physical space to make it seem like a room meant for Yoga. Alison Wesley is a Certified Yoga Therapist, Franklin Method Educator and owner of Working with Yoga. She lives in Portland, OR and teaches yoga classes at offices in the area, working for companies such as Intel, Adidas, Harsch, Guide Dogs for the Blind, The TrailBlazers staff, G Diapers and Clackamas County. 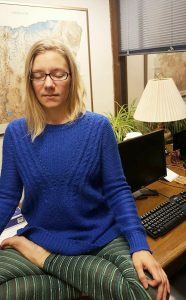 This post is the third installment in the 4-part series about teaching yoga in office settings. Don’t miss the rest of the series! Thank you for this blog…I just taught an outdoor class and although it was a beautiful day, cool breeze, warm sun, I was distracted. Lawn blowers making noise, cars here and there, and sometimes the occasional bug would wander on my mat. I felt like I was talking too much to overcompensate for my distractions. This is not what a yoga teacher should aim to do in their class! It’s not about my experience, it’s about my students, and the space I hold for them. Where they place their mat. I will remember this blog…thank you. I feel you. I have taught high school students in classrooms around the school for the past 4 years. We have no control over light or temperature and I have grown accustomed to dusty footprints on my mat. Though I have never been interrupted during savasana or pranayama, my classes have had janitors come through, a high school wrestling team showed up early to the space, students come in to pick up things they forgot, and announcements blaring over the intercom. The beautiful thing is watching my dedicated students not bat an eyelash as any of this happens. It’s the only yoga they’ve ever experienced. They will be blown away by a calm, clean, quiet space! !